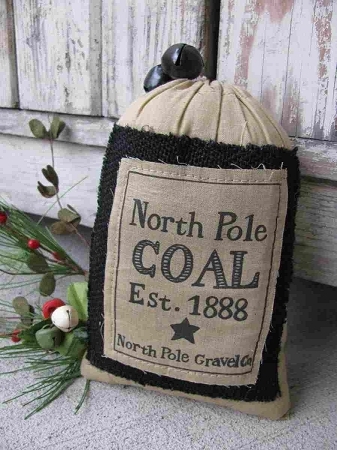 Primitive North Pole Coal Bag with Jingle Bells. North Pole Coal Sack, stuffed and tied with two rusty jingle bells. Holiday accent piece or gift with some humor. Size is 7"x5". Lean up against Santas, place under your tree, set inside a sleigh, a fun piece to decorate with.